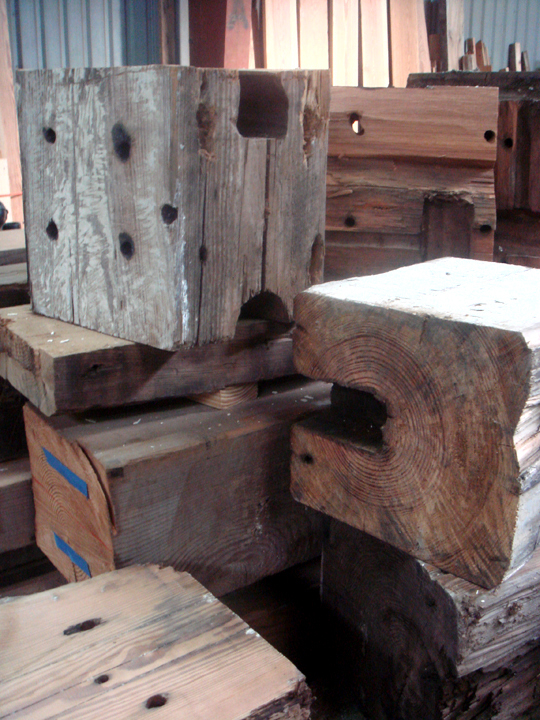 Speaking of wood… the pieces for the 2nd Floor lounge are still coming together. We. Are. Almost. There. Gave a brief presentation yesterday letting the company know about the rooms’ various cool bits. MP3 player and built in speakers. Indeed. Metal car parts-turned-coffee table and bar console. Check. 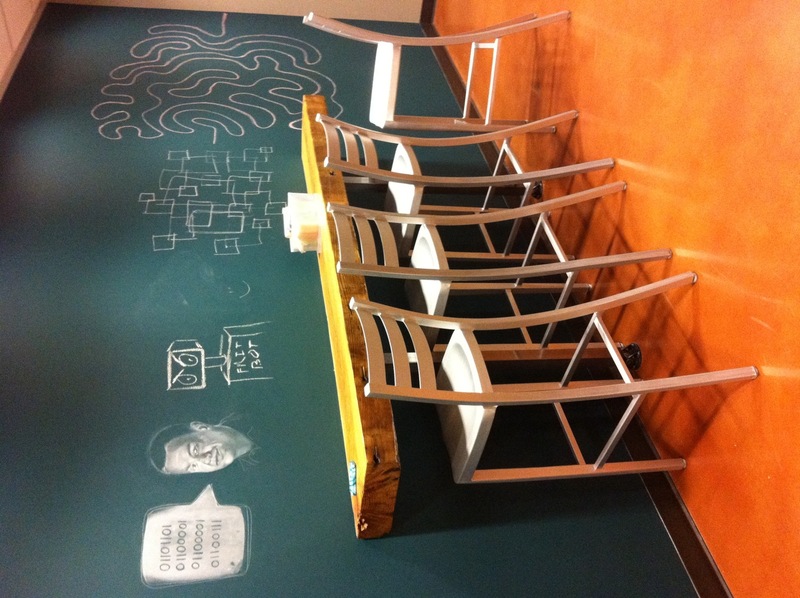 Interactive chalkboard wall. Yep. über durable hand-woven hemp rug. Dude. Gadora envisioned funky wooden blocks that might serve as extra seating or side tables, and a bar along the back wall for laptops and drinks (keep reading!!). I found a stellar wood resource through a contractor, who then connected me with Lee Edwards of Old Texas Floors. Walking through Lee’s massive warehouse of stacked wood harkened a bit of nostalgia. The smells and infinite hues of lumber reminded me of my Granddaddy Henderson who, among other things, was a wood turner. I’d saunter down to his self-built metal barn and proclaim, “whacha doin?” He’d stop long enough to entertain me for a bit, then would get back to his wood-turned bowls and twisty candelabras. On my way out I’d stir up some sawdust, climb on his old Ford tractor, then skip my way back to Grandma in the house. I was too young to truly appreciate how special those days were. Lee was excellent to work with, and skillfully interpreted my original ideas better than even I imagined. 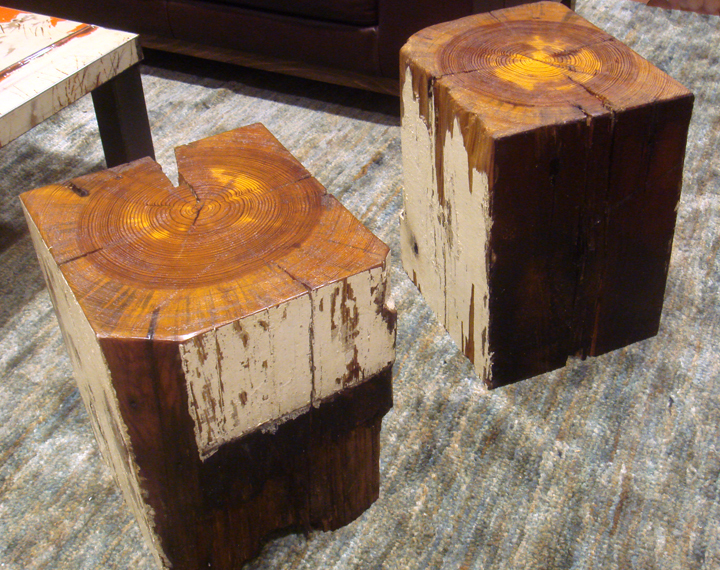 AND the finished pieces are a PERFECT complement to Joel Hester’s coffee table. I can hardly stand it!!! 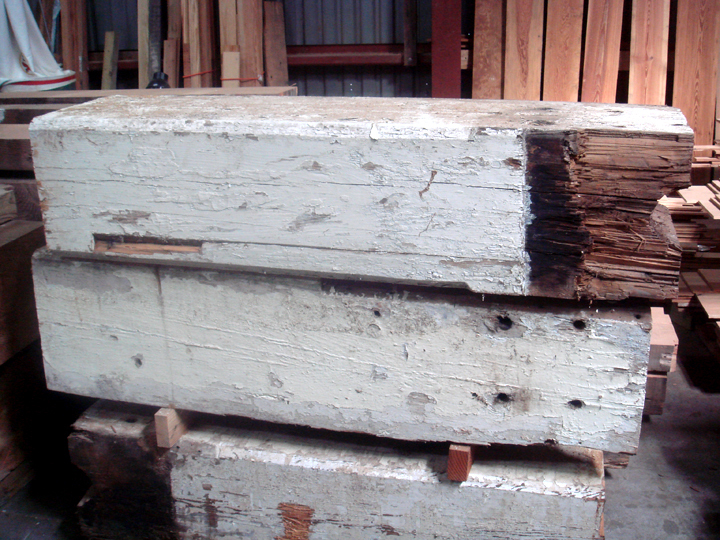 The stools came from 100-year-old beams rescued from a warehouse in New Orleans. They were stacked so neatly and begged for a little attention. He’d normally use them for flooring, but a quick negotiation promised them for the 2nd Floor lounge project. I knew immediately they’d turn into something spectacular. 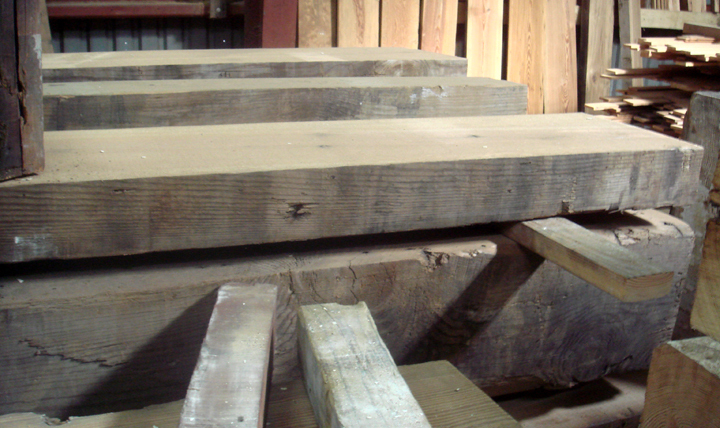 A profile of other support beams gave the idea to preserve the bottom notch. We’d keep the holes. We’d preserve as much of their original integrity as possible. 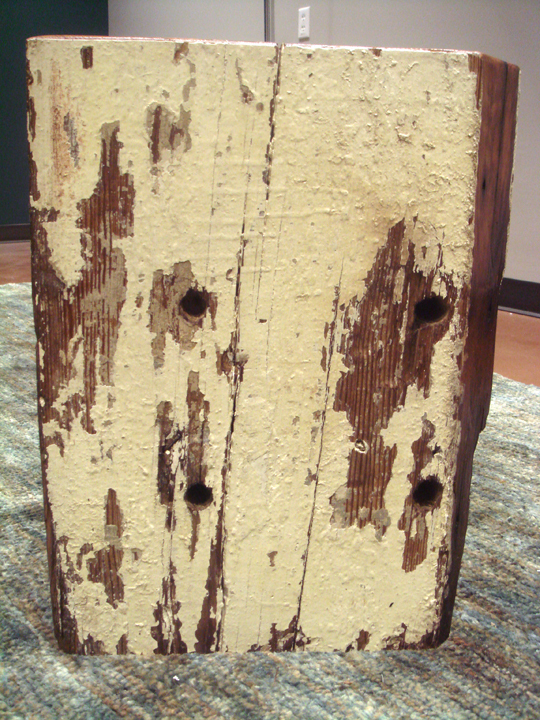 One of the wickedly heavy stumps boasts a large cross beam hole, “Look inside and you’ll see a hand-sewn wooden spike. FUN! There’s also a metal spike in the same hole.” How cool is that? 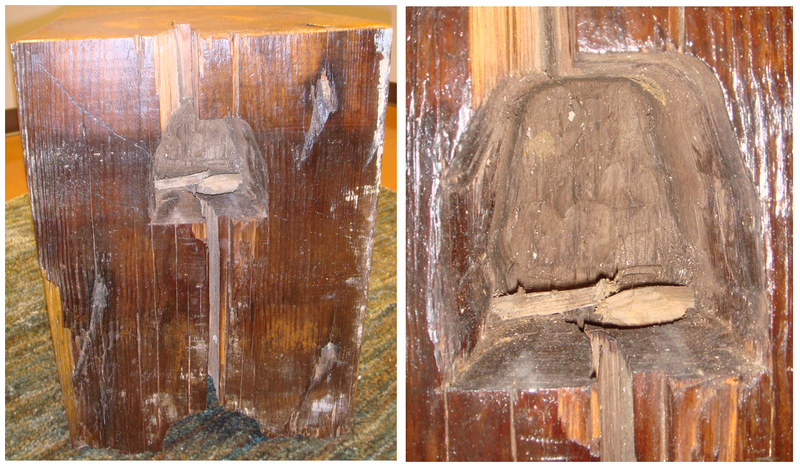 The Douglas Fir shelf is around 100 years old and was rescued from a warehouse near Chicago. I liked it had imperfections and Lee’s handy-work draws attention to them, and preserves them just the same. Lee Edwards work was expeditious and quite affordable. Gadora is a big fan! Posted on October 2, 2010 November 7, 2012 by gadorawilderPosted in MusingsTagged Architecture, Do-it-Yourself, vintage. Next Next post: Sundance ~ A Good Dog. Loved the old wood and the comments about WT. Judy and I, mostly Judy, rescued an old round log from Blackwater that makes a perfect side table on my patio. Already cut to size. Good work. Love ya. Unbelievably awesome – you are definitely leaving your mark on the 2nd Floor Lounge, girl!